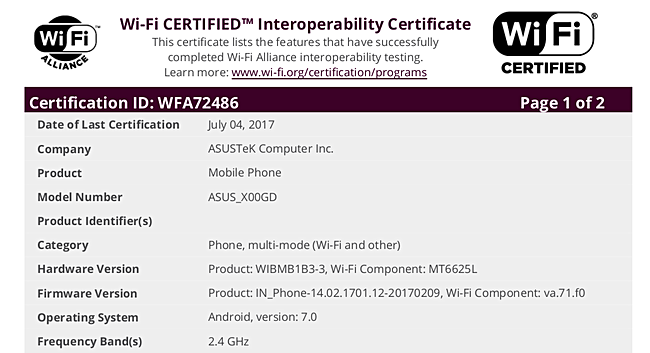 The Asus X00GD has received WiFi certification from the WiFi Alliance (WFA). The device was previously spotted on the website of Chinese telecommunication authority TENAA in December last year. The WiFi listing for the phone reveals Android 7.0 Nougat OS, something which we already knew, thanks to TENAA. Other key specs that TENAA revealed include octa-core 1.5GHz processor, 5.2-inch HD display, and 13MP/8MP camera combo. RAM options include 2/3/4GB, while storage options include 16/32/64GB. The device packs in a large 4,850mAh battery. WFA listings typically come pretty close to a device's market launch so we should be hearing more from Asus soon.